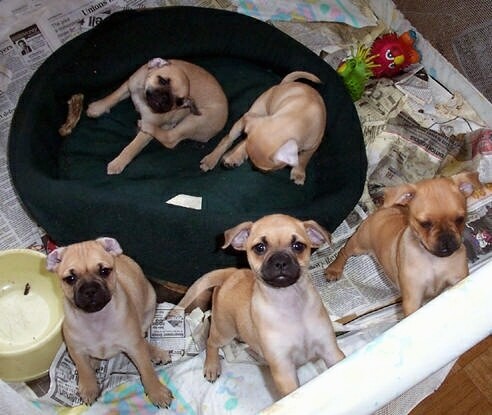 According to the American Canine Hybrid Club, the Miniature Pinscher and the Pug cross is called a Muggin. DBI has learned other breeds thought to contribute to Carlin Pinscher type have been, and are being introduced to the Carlin Pinscher gene pool in an attempt to create a new breed. Therefore, we have separated the Carlin Pinscher from the Muggin. The name "Muggin" is what the American Canine Hybrid Club calls the Pug / Min Pin cross. If you would like to adopt one of these dogs and have a preference in which type you would like, before adopting, ask the breeder which type dog they are breeding, the Muggin or the Carlin Pinscher. For a developing breed, Carlin Pinschers are very similar in appearance. The Carlin Pinscher has no breathing problems due to the fact that it has some of the Miniature Pinscher's muzzle. The Pug has given it thicker legs and a stronger looking body. The coat is the same as the shorter, almost non-shedding coat of the Miniature Pinscher. 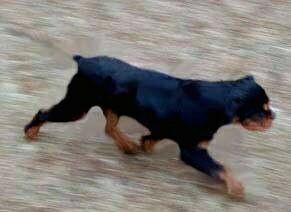 The color that it is being bred for is black and tan. According to Isabeau, one of the Carlin Pinscher's original developers, "They are patient and pleasant like a Pug," although they still retain some, but not all of the Miniature Pinscher's terrier-like behaviors. This is an even-tempered breed, exhibiting stability, playfulness, great charm, dignity, and an outgoing, loving disposition. Most puppies raised with respectful children who know how to show the dog leadership, grow into respectful, gentle dogs. Obedience training and a firm pack leader is a must for all dogs, as an ill-behaved dog is more likely to harm a child due to lack of leadership. Make sure you are this dog's firm, confident, consistent pack leader to avoid Small Dog Syndrome, human-induced behavior problems. Always remember, dogs are canines, not humans. Be sure to meet their natural instincts as animals. The Carlin Pinscher is good for apartment life. It is very active indoors and will do okay without a yard. The Carlin Pinscher should be protected from the cold. These dogs do not require a lot of exercise but should be walked daily to fulfill their primal canine instinct to walk. In addition, they should be given regular opportunities to run and play. Make sure any yard in which they can run loose has a fence high enough to prevent their determined efforts to escape and explore. About 15 or more years. The Carlin Pinscher's smooth, shorthaired, hard coat is easy to groom. Comb and brush with a firm bristle brush, and shampoo only when necessary. Loose hair can be removed by wiping over with a warm, damp washcloth. This breed is an average shedder. Originally called the Pug-Pin, this breed began as a cross between the Miniature Pinscher and the Pug. Other breeds thought to contribute to Carlin Pinscher type have been, and are being introduced to the gene pool as well. The name Carlin comes from the Pug, as in some countries the Pug is known as the Carlin. It was decided in 1998 to create a new breed. The idea came from three friends of Grant Milionta's. Their names were Isabeau Morgan, Katushka Vitrichenko and Kawika Buenafe. 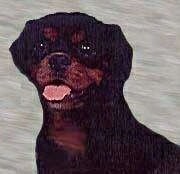 During 1992 in France, Isabeau and Katushka saw dogs that looked like miniature Rottweilers. The owner told them that they were a cross of Pugs and English Toy Terriers. In Honolulu, Kawika also saw a dog that looked like a toy Rottweiler. Kawika was told by the owner that the dog was a cross of a Miniature Pinscher and a Pug. Sometime later when Kawika and Isabeau went on vacation, they left their champion Miniature Pinscher stud dog that they co-owned with an owner of a black Pug. When they returned from their vacations, they found that their stud dog had accidentally bred the black Pug. Three puppies were born, all looking like miniature Rottweilers. All three were fixed and one went to Grant Milionta. Grant's dog was named Snooz. Many people wanted a dog like Snooz and someone even tried to steal her. After much research and planning, Grant then decided to create a new breed based on Snooz, along with the help of Isabeau, Katushka, and Kawika. It was decided that the red Miniature Pinscher used to breed Snooz should be used and bred to black Pugs. Female Pugs were used because they are accustomed to having large-headed pups. Using these dogs, all puppies born had a black and tan coat, of which solid black is dominant. Today the Carlin Pinscher is being carefully bred for selected traits by an earlier breed club consisting of Grant, Isabeau (who is stilling working with her Miniature Pinschers), Katushka and Kawika (who are also still working with Miniature Pinschers and Greyhound adoptions). The Carlin Pinscher is not quite a purebred dog. A purebred dog is one that has a documented history of ancestry—called a pedigree—of many, many generations of the same type. At this time most Carlins have only one or two generations of documentation. In the near future the Carlin Pinscher will be applied to various clubs as a developing breed.